You know a film adaptation is good when it makes you want to go back and re-read the book. 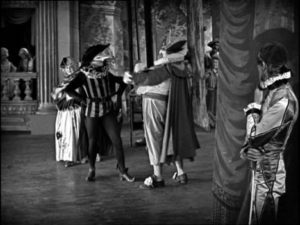 Scaramouche is a real gem, and a close adaptation of Rafael Sabatini’s novel, which had been a recent (1921) best-seller. The production has the same director and cast as the previous year’s Prisoner of Zenda, but with a swap at the top, Ramon Novarro cast as the romantic lead, André-Louis Moreau, and Lewis Stone taking the part of the supporting villain, the Marquis d’Azyr. It was a good move, as the fiery young Novarro was perfect for the role of Moreau/Scaramouche—in fact, much better suited than the rather stolid Stewart Granger in the better-known 1952 version. It’s France under Louis XVI, and we’re back in Mordor again, with the populace ground down by the oppressive nobility. Many of the bloated aristocrats are hilarious caricatures—the Minister of Justice could pass for Baron Harkonnen. The movie starts out a little slow, establishing its characters and Moreau’s reasons for revenge on the aristos, but really gets moving once he’s on the run and joins a troupe of traveling actors. As a stage performer, Novarro gets to unleash his undeniable charm, and once he dons the striped outfit of Scaramouche we’re off to the races. The film spends an hour covering the same ground as the ’52 version—the first, more personal half of the novel—and then goes beyond into the politics, glories, and horrors of the French Revolution, which are depicted convincingly. The costumes and make-up are superb, and in a series of dueling scenes we see the first really good fencing of the silent era, swordplay both persuasive and exciting. And instead of the usual contrived happy ending, the film is true to its source and retains the rather dark finish of Sabatini’s novel. Aux armes, mes camarades! Visual bonus: snuff boxes and quizzing glasses!